Strong and aesthetically pleasing, this perforated rectangular steel picnic table is a popular addition to high volume outdoor spaces. The convenient walk through design, provides for maximum user accessibility, inclusion and comfort. The shared appeal of this picnic table is the all steel construction with top-of-the-line, weather, vandal and corrosion resistant finishes. Quality 2-3/8"O.D. steel tube frame with 1"O.D. support braces that have been MIG welded together for top stability. 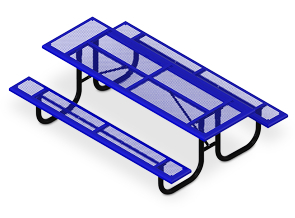 This highly popular, perforated rectangular steel picnic table is available in 6', 8' models and single or double sided ADA compliant lengths. The perforated seat and table top design create an inviting decorative appeal that is easily maintained. Made from trusted commercial grade steel and engineered with comfortable, rolled edges that complete the classic styling of this picnic table.